Tess Johnson, of Vail, competes Friday, Feb. 9, in the qualification round in the freestyle moguls event at Bokwang Phoenix Park at the Winter Olympics in Pyeongchang, South Korea. Johnson finished 22nd in the qualification round. PYEONGCHANG, South Korea — Tess Johnson said she isn’t surprised that she’s competing in the Olympics as a 17-year-old. She said she’s always believed that she could make it to this stage as a high school senior. But now that it’s reality, she’s shocked. 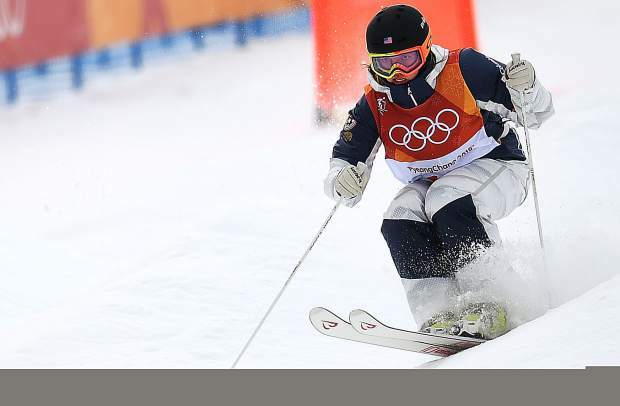 The Vail moguls skier began her Olympic competition Friday at the Bokwang Phoenix Park freestyle venue, competing in the qualification round. She finished 22nd out of 30 in Friday’s qualification, making a mistake on the landing of her top air. She didn’t automatically advance to finals — the top 10 skiers Friday did — but she’ll have another shot at qualification on Sunday. She’ll need to place in the top 10 of the remaining 20 unqualified skiers on Sunday. Johnson’s longtime Ski and Snowboard Club Vail coach Riley Campbell said she’ll have a chance to reassess and tune up her approach Saturday before competing Sunday. Her family — mom Carol, dad T.J., sister Anabel and brother Tommy — arrived from Vail to cheer her on. It’s probably the first time in four or five years that both parents and both siblings have watched her compete, Tess said. The Vail community rallied to help send the family, exceeding a GoFundMe goal of $15,000 within days. A well-attended fundraiser at Ein Prosit late last month raised even more. Anabel designed “Team Tess” hats, produced by local company Ski Town All Stars, while businesses around the valley donated items for a silent auction. Tess, who attends Vail Ski and Snowboard Academy in Minturn, has already helped her high school soccer team, Vail Mountain School, win two state titles. But skiing has raised her achievements to a completely new level. Campbell is at the venue thanks to his coaching of Casey Andringa, another moguls athlete. That’s a special bonus for Johnson. Campbell has been her coach since she was in the seventh grade. Campbell said Johnson — one of six 17-year-olds on the U.S. Olympic Team — is handling her Olympic debut with poise. Johnson and her teammates arrived last week. They are among the very first to compete in these Winter Olympics. The qualification round was actually before the Opening Ceremonies itself. Perhaps the Opening Ceremonies is when Tess — and her whole family, who will also attend — realizes that, yes, this is really happening.